Dr. Gokarn speaking on the occasion said currently he is observing economic activities in the Asian region and he selected Sri Lanka as the first stop of his observation tour. 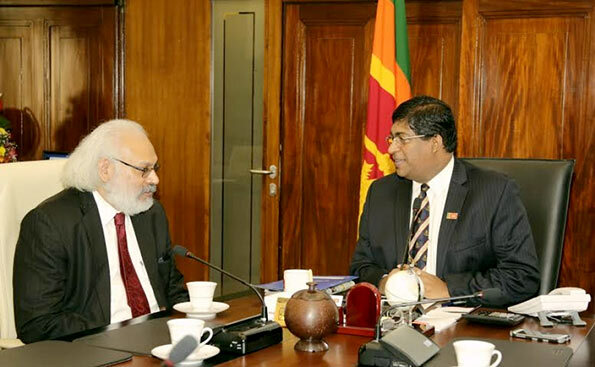 Executive Director of International Monetary Fund Dr. Subir Gokarn met Sri Lankan Minister of Finance Ravi Karunanayake on Jan.04 at the Finance Ministry premises. Dr.Subir Gokarn is the new Executive Director representing India, Bhutan, Bangladesh and Sri Lanka at the International Monetary Fund (IMF). The Finance Minister expressing his observations briefed them on measures taken by the government led by President Maithripala Sirisena and Prime Minister Ranil Wickremasinghe to ensure good governance in the country. Finance Ministry Secretary RHS Samaratunga, Director of the Economic Research Department of the Central Bank of Sri Lanka Mahendra Siriwardena also participated at the above meeting. Finally the master has visited the incompetent slave!